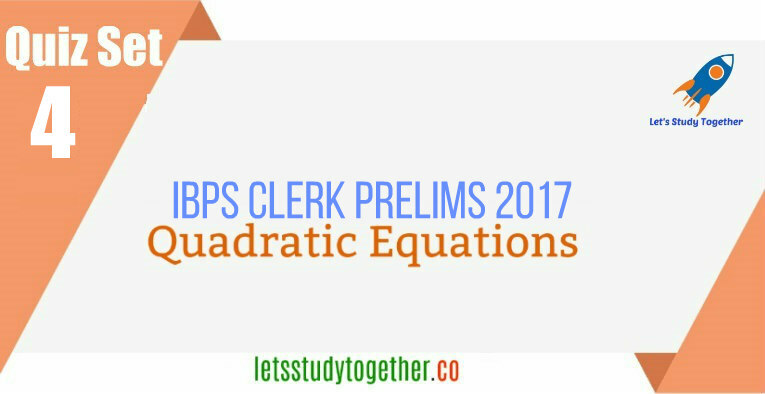 Quadratic Equation Question for IBPS Clerk 2017. Welcome to the letsstudytogether.co online Quant section. 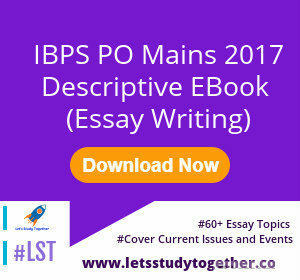 If you are preparing for IBPS PO/Clerk 2017 exam, you will come across a section on Quant Section.Quadratic Equation Quiz Set -4 IBPS Clerk. Here we are providing you with Quant quiz “Quadratic Equation for IBPS Clerk 2017″based on the latest pattern for your daily practice.This “Quadratic Equation for IBPS Clerk 2017” is also important for other banking exams such as IBPS PO, IBPS Clerk, SBI Clerk, IBPS RRB Officer, IBPS RRB Office Assistant, IBPS SO, SBI SO and other competitive exams. 2.Directions: In the questions, two equations I and II are given. You have to solve both the equations and give answer. 3.Directions: In the questions, two equations I and II are given. You have to solve both the equations and give answer. Therefore, relationship between x and y can’t be determined. 4.Directions: In the questions, two equations I and II are given. You have to solve both the equations and give answer. 5.Directions: In the questions, two equations I and II are given. You have to solve both the equations and give answer. 6.Directions: In the questions, two equations I and II are given. You have to solve both the equations and give answer. 7.Directions: In the questions, two equations I and II are given. You have to solve both the equations and give answer. 8.Directions: In the questions, two equations I and II are given. You have to solve both the equations and give answer. Therefore, no relation can be established between x and y. 9.Directions: In the questions, two equations I and II are given. You have to solve both the equations and give answer. 10.Directions: In the questions, two equations I and II are given. You have to solve both the equations and give answer. Therefore, no relationship between x and y can be established.